“You dog people are crazy,” my beau said when I told him about my canine enrichment plan. “Don’t drop your camera,” he said. “Worth a try, I guess,” he said. Then he snickered. Riggs, my resident rogue, isn’t known for his brilliance, though he has other great qualities. When he was a puppy, I took him everywhere, knowing that socialization in the early months was vital. Later, while helping breeder Pam Headon research a book, I discovered my job wasn’t done. Some experts recommend ongoing socialization, especially until the dog reaches social maturity at about age three. Take your dog out at least twice a week—once for training, and once for another activity. The training is less about what the dog learns than about experiencing the wonders of the environment with a positive spin. … You can also reinforce some of the behaviors you’ve worked so hard to teach, such as being calm around other dogs and children. I’d done my best. Riggs and I had joined agility class, which we bonded over disliking. 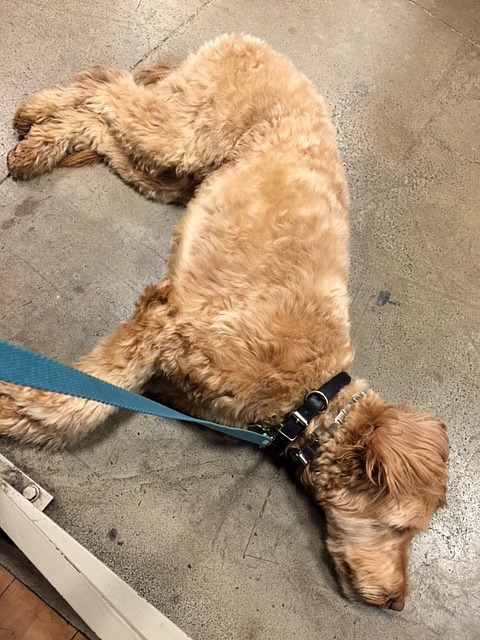 Then we tried advanced obedience and drop-in dog socials, which worked better. Basically, I took him wherever he was welcome, and as my left-hand man, he’d become pretty much bombproof. Last year, I enriched Riggs’ life further by giving him a canine baby sister. Mabel, my sweet sensitive darling, needed far more socialization than Riggs ever did. And since she borrows courage from her stalwart blond companion, I had to sideline Riggs sometimes and get her out on her own. 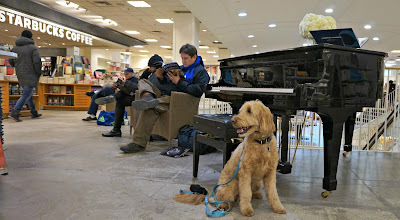 Besides, it soon became obvious that while one canine sidekick was company, two were seen as a crowd. Riggs didn’t exactly suffer. 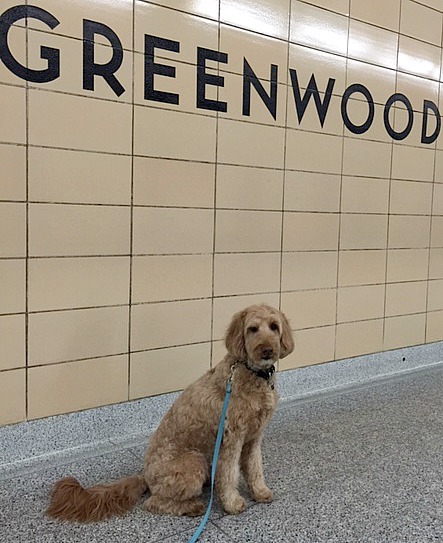 In addition to beach runs, day care, and cottage trips, he got regular hikes through Toronto’s ravine system. But social enrichment had taken a nosedive. Our little pack fell into a rut. One day it struck me that I missed him. We never have any one-on-one time anymore, and as my first dog ever—my golden boy—I’d loved our partnership. It was time to resume our outings. So, last week, Riggs and I traded our usual icy trails for the sleek marble of the Manulife Center at Bay and Bloor in downtown Toronto. Although his first subway ride unnerved him, he was happy to accept treats, so I knew he was being enriched, rather than traumatized. 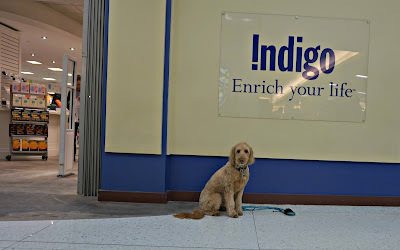 Once inside the upscale mall, he calmed down and glided gracefully by my side to the bookstore, Indigo, which is where I do some of my best brainstorming. By the time I was finished my latte, Riggs had acclimated to café lifestyle. He was ready to do some serious posing, which meant it was my turn to be nervous. Not only am I a photography novice and dropper-of-cameras, I also hate drawing attention to myself. By now, it was lunch hour, and extremely busy: no one was going to miss this show. Leaning against the marble wall outside the store, I snapped off a few quick shots. Blurry. Shaky hands. I tried again. By this point I’d slid down the marble wall to the floor. I looked up to see a row of construction workers in orange vests waiting politely to cross my sight-line. But the voice actually belonged to a colleague from my day job. “You dog people are crazy,” she said. By the end of the outing, I believed it. A lot of people had stopped to say hello and pat Riggs. A few had even asked for a photo op, and Riggs happily obliged. On the subway, Riggs flirted with the lady next to me. He was already a veteran commuter. Navigating stairs, subway, escalator, elevator and crowds. Meet and greet with 20+ people. 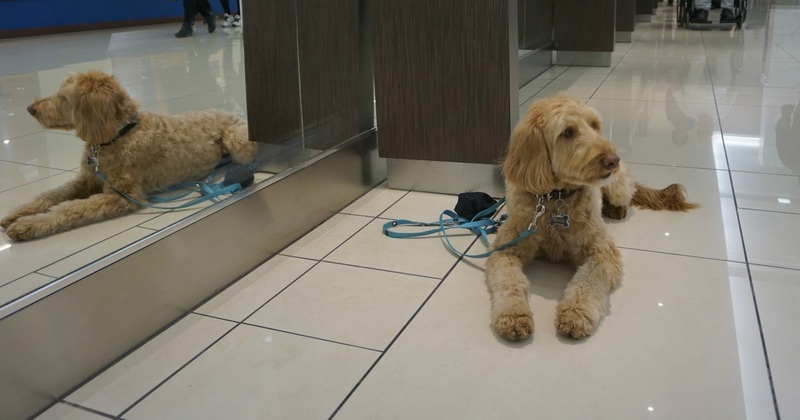 Polite mingling with mall dogs in designer jackets. So the rogue and I will hit the town again. I need some suggestions for dog-friendly destinations. 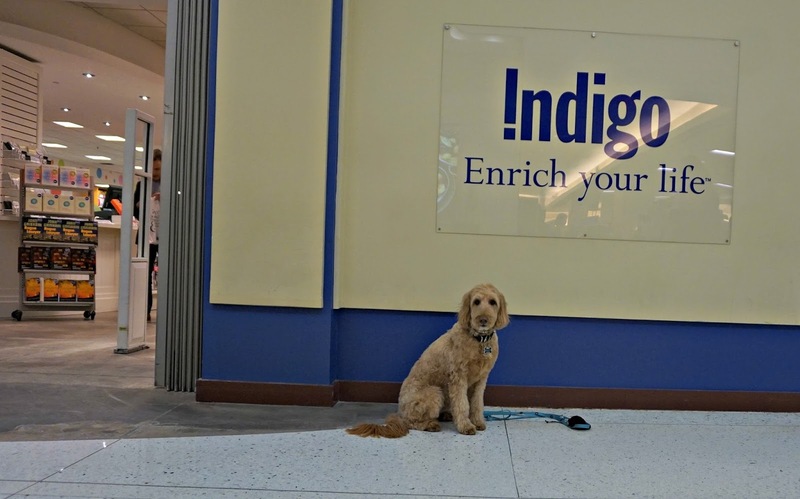 Where do you take your dogs? *Please follow Rogues & Darlings if you'd like to receive updates as they're posted. If interested in being interviewed, contact rideoutsandy@gmail.com. Thanks, Gail. I have not had enough one-on-one time, but never too late to start.